Ahhhh... a relaxing day at the beach. Colorful umbrellas, soft sand, and relaxing surf. What could make a beach day any better? How about cupcakes! Yum!! 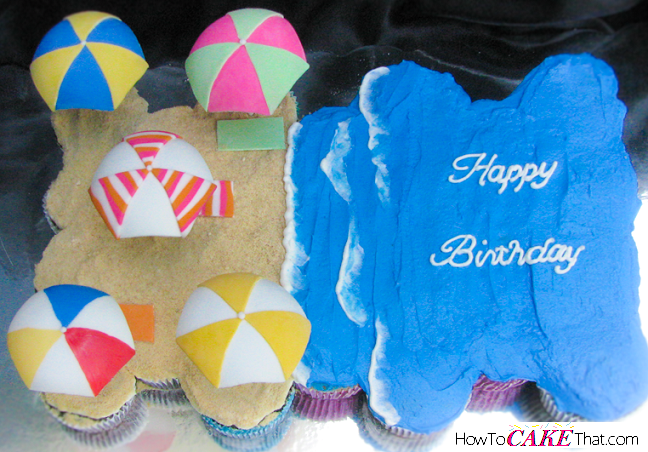 Learn how to make this cute pull-apart beach theme cupcake cake in this easy tutorial! For this cupcake cake I used 25 cupcakes. 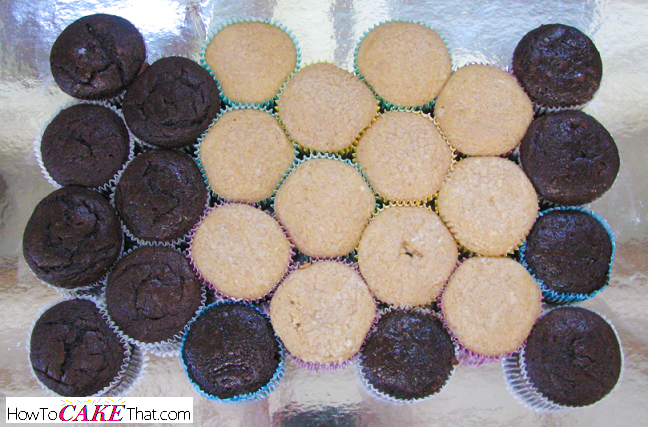 To begin, arrange your cupcakes on an appropriate size cake board. I'm using Wilton's 13" x 19" cardboard cake platter. 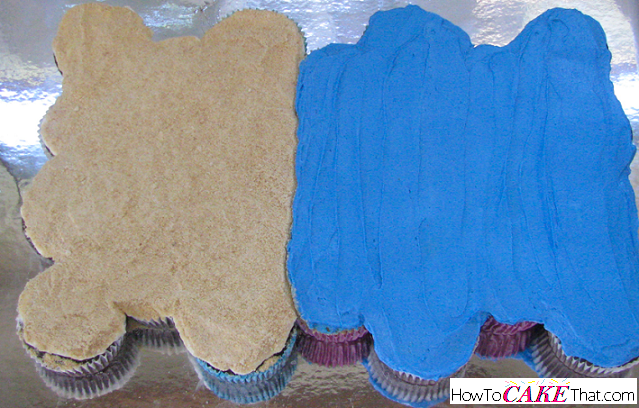 Once your cupcakes are in place, "glue" them to the cake board by placing a coin-sized dot of buttercream on the bottom of each of the cupcake wrappers, working one at a time until each cupcake is glued down. 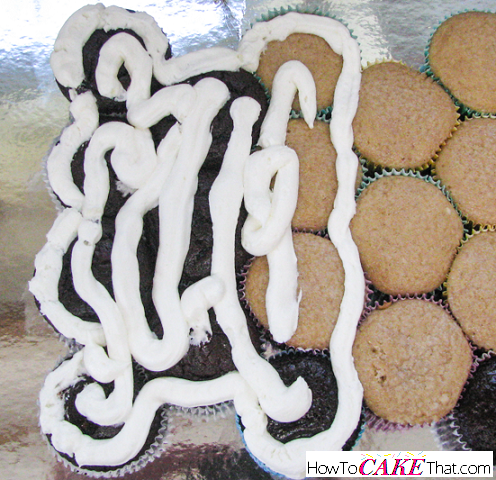 Next, fill a piping bag with the buttercream of your choice. Leave the piping bag open-ended, no coupler or tip are needed. Pipe an outline of where the sandy beach will be, then fill in the outlined area with remaining buttercream. 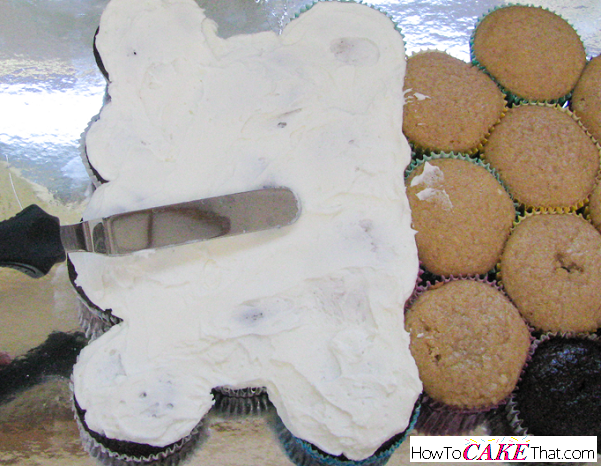 Using a small offset angled spatula, smooth the buttercream over the cupcakes in the sandy beach area. 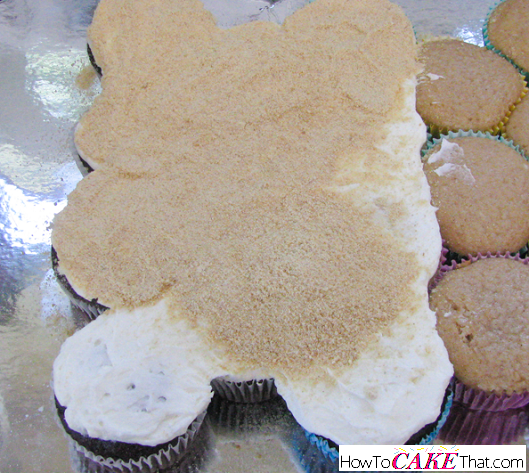 Quickly add "sand" to the buttercream before the buttercream has a chance to crust over, and spread evenly. For the sand, feel free to use graham cracker crumbs, cookie crumbs, brown sugar, or my Edible Sand Recipe. 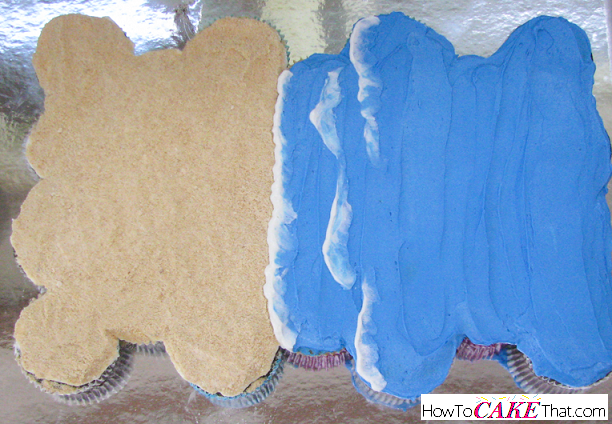 Next, color some of your buttercream blue to use as the "water". Be sure to reserve some white buttercream to use for the surf and for writing on the cake. I used Wilton's Royal blue gel color for my water. 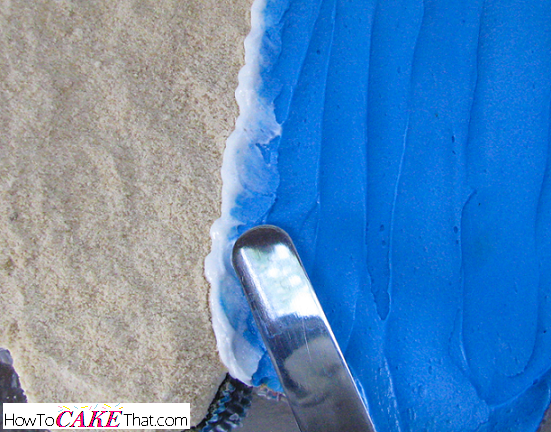 Next, fit your piping bag with a #3 or #4 small round writing tip and pipe over the seam where the blue water meets the sand. To make your surf look more realistic, use the back of an offset angled spatula and lightly place on the back half of your white piped line and gently pull back to smear the white over the blue water. 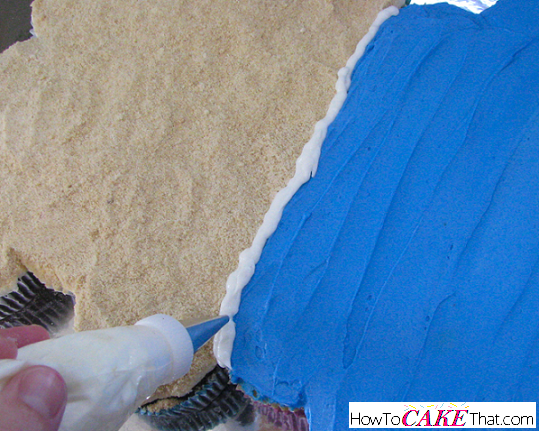 Be very careful not to pull the frosting back and away from the sand. Add more surf if desired, to make it look like waves rolling in. Decorate your beach any way you'd like! For my beach, I added fondant umbrellas from my 3D Fondant Umbrella Tutorial and also added little rectangle fondant towels. Aren't they cute?! I hope you have enjoyed this tutorial! God bless! !